Join fellow clinicians and healthcare partners for an engaging and innovative conference. Earn Continuing Education Credits with two keynote speakers and nine breakout lectures. You are sure to leave the conference with new relevant information and prepared to provide the best care possible. Visit with over 30 industry-relevant exhibitors & network with colleagues & industry partners. MHRC is open to ALL healthcare professionals. Our breakout sessions focus on the educational needs of nurses, case managers, physical therapists, occupational therapists and social workers. Registration for this event is $100.00. Cancellation refunds will be honored until March 29, 2019. Student registration for this event is $50.00. Interested in bringing the whole office? 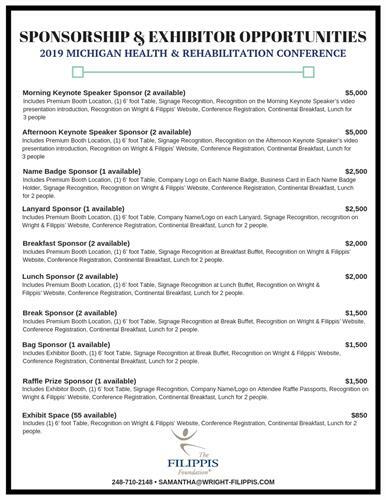 As a MHRC supporter, there are many sponsorship & exhibit options available.